I was a contributor to the waterwinterwonderland.com web site until the webmaster and I had a parting of the ways over a "Deport Granholm" banner ad I objected to. Most of the articles in my Flinn's Journal page were formerly in the waterwinterwonderland.com web site. Now that I'm being paid $50 per published article in The Flint Journal and in Your Magazine, my days as a volunteer columnist are over. I hope eventually to include my old columns which were published in the old Uncommon Sense alternative paper which ceased publication last year. Timeless articles may wind up in either Your Magazine or The Flint Journal if I can get permission from Matt Zacks who I understand is in Massachusetts now. The old US articles which were more timely, such as the Goodbye WFDF article when the station moved to the Detroit area would be added to my own history web site. Thanks for the link, Gordie! Good stuff! Hey GY -- Off topic but you are the man. I'm sure the comments don't keep up with what a great job you're doing. You've been gone from Flint long enough to have fond memories without being snarky. Thanks -- grew up on Copeman in the late 80s near Welch and Ballenger. I read you everyday. You rock!! Drove by the White Eagle many a time, but never realized it was a theater. Industrial Ave. was one of my favorite streets back when it was actually industrial. Geez, there are all sorts of west sider, new Northern, Civic Park, and old eastsider types posting here. Where are all of those East Village snobs with their advanced degrees and NPR mugs? Huh? Oh, they're collecting 6 figure salaries and livin' in neo-bohemia? Really? Poor Matt Zaks. He really tried to do something, but Flint just ground him down. Last I heard he was publishing a gambling magazine?!? Anybody wanna take bets on how long before Dayne Walling packs it in. 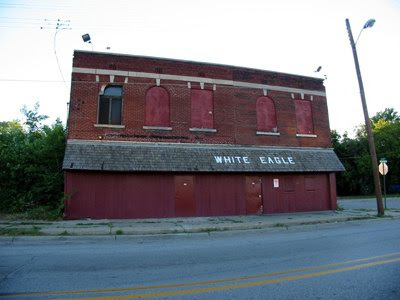 The White Eagle reminds me of those buildings - I think all of them were bars - at the corner of Chevrolet Ave. and Glenwood right by Chevy-in-the-hole. There may have been something similar on Court St., too, not too far away. Seems like we had a photograph of at least one of them on flintexpats awhile back. Since we are shouting the thanks... great job on the site... I find myself checking daily as well... I've learned alot about Flint which I had forgotten or simply never knew. My Uncle says the East siders in his neighborhood used to go to the Roxy on Lewis and Broadway... no longer there now. i remember that on chevrolet and glenwood they put up a facade on the bar to resemble an old west town and saloon...kind of like the guy over on davison rd. does anyone remember the Vega theater on corunna....it was right across the street from tommy hunts sporting goods. the vega went in after mac's electric went out. how they pulled that off is beyond me???? My mom remembers a theater called "The Regent" that was near or on Saginaw Street near St. Michael's...anyone else know this one? PS I love that waterwinterwonderlandsite...and yes I have spent hours looking at it! I just talked to my mom, and she remembers seeing an Elvis Presley movie at The Regent, located at 906. N. Saginaw near Louisa. She remembers not telling her parents what she was seeing, because they liked Bing Crosby and NOT Elvis. She also briefly dated a guy who sold shoes at The Vogue and lived above the theater. By the way, she also remembers seeing her friend's band, The Rhythmeers, at the Jewish Community Center, which was just a few blocks up Saginaw. And, I remember going to Sweet Marie's Candy Shop, which was near the corner of Chippewa and Louisa behind St. Mike's. Anyone remember that place? I remember the White Eagle as a very smelly watering hole. The door facing Industrial was always left open and you could smell the urine clear out to the street. My brother inlaw bought the old wooden phone booth that was inside the bar and placed it in his recreated 50's malt shop in his rec room in Fenton. Bogner Music now occupies the former location of the Vega Theatre. After the storefront theater closed, a second-hand clothing store opened showing no sign that the previous tenant was a movie theater.